Due to the high altitude, the people from Ladakh are quite different from the rest of India. Their skin is very hard and tough; their physique, food and clothing habits are mostly similar to the people of Tibet and Central Asia. The original population of Ladakh might have been the Dards, an Indo-Aryan race. Presently the majority of people living there follow Buddhism and Islam. Very few Hindus reside there. 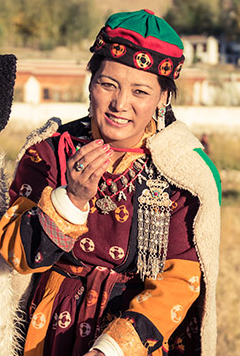 The Ladakhi people are said to be the most simple and cheerful in nature. Even their lifestyle is very simple and they prefer to remain close to the nature. The people of Ladakh traditionally lead a nomadic pastoral life. The most prominent occupation in Ladakh is agriculture. The people of Ladakh are keen in trade and travel to long distances for seeking favourable prices for their products. Buddhism is the main religion of Ladakh. The monasteries in Ladakh display the impact of Buddhism. Men traditionally wear a thick woollen robe called a ‘Goucha’. It is tied and fastened at the neck and the waist with a colourful sash called ‘Skerag’. Women wear a similar robe to the ‘Goucha’ that is called a ‘Kuntop’. On their backs, they wear a colourful shawl that is used to carry babies or parcels. One of the most prominent features of the Ladakhi society is the position of women. Unlike most rural parts of India, the women in Ladakh hold a prestigious and respectful position in the society and enjoy greater freedom.